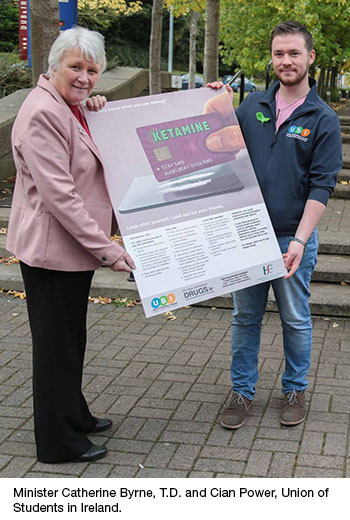 Minister of State for Health Catherine Byrne, TD officially launched a new information campaign which was developed by the Union of Students in Ireland in partnership with Drugs.ie and the HSE. The information campaign focuses on harm reduction and it's aimed at young adults and students who use new psychoactive substances (NPS)*. The use of psychoactive drugs in Ireland among the 15-24 year age group is the highest in Europe (22% lifetime use). Data suggests that the purity or potency of most illicit substances is increasing and that the market for substances is becoming more varied and accessible. This phase of the campaign focuses on two specific drugs MDMA (ecstasy) and Ketamine (K); this is the first step of an ongoing campaign to provide harm reduction information for students. Two posters have been designed along with Facebook ads and a social media campaign to give harm reduction advice and information on accessing support. “USI is delighted to be working closely with the HSE and Drugs.ie on this harm reduction campaign. Ongoing use of a variety of substances by young people and students has rightly attracted attention and concern due to the significant number of physical and psychological side effects associated with their use. As such, it's important for us to ensure that students' relationship with substances is as safe as possible. "Drugs can be unsafe, but if you do take them, follow a harm reduction regime. We are urging students to be vigilant against unknown substances." ‘’The HSE is partnering with the Union of Students in Ireland to target students and young people with an appropriate Harm Reduction message. Harm Reduction refers to policies, programmes and practices that aim to reduce the adverse health, social and economic consequences of the use of legal and illegal psychoactive drugs. Harm reduction benefits people who use drugs, their families and the community.